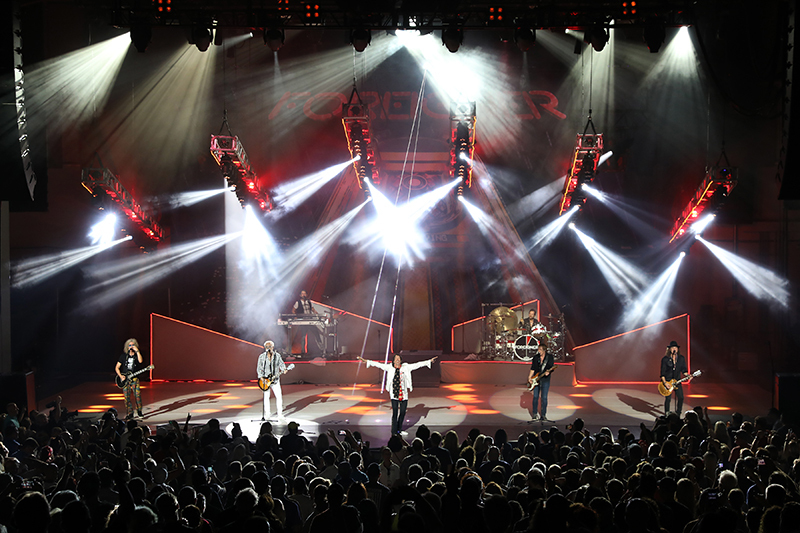 Last year, Foreigner celebrated the 40th anniversary of their debut album, and this year marks five years of service for lighting designer Dan Lastovka. The man has certainly been having fun working with the iconic classic rock band, and its guitarist/co-founding member Mick Jones has been game for trying things that are fun and hearken back to his group’s heyday. Technology may have advanced tremendously since the ‘70s and ‘80s, but there are some ideas that never go out of style. 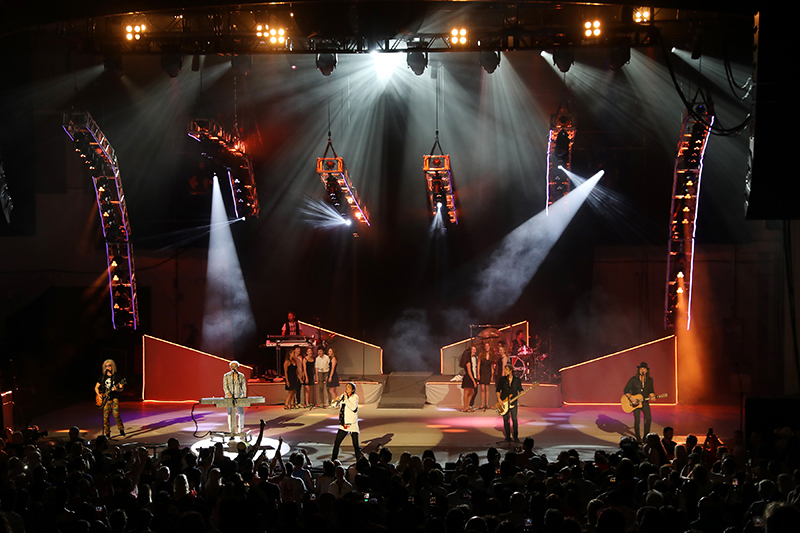 Once again, the production turned to See Factor for all their lighting and audio needs as they keep up with current technology. Lastovka and company are definitely going for a true classic rock concert vibe with this summer’s Foreigner tour (with Jason Bonham and Whitesnake supporting). 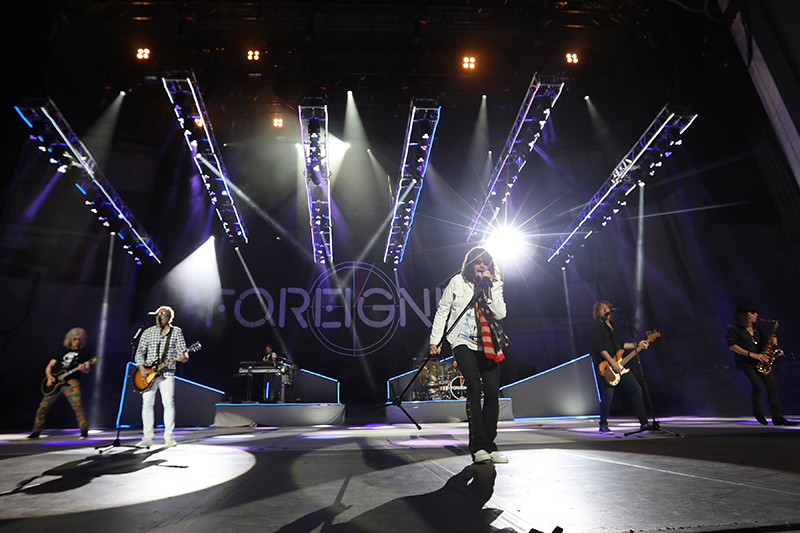 This time out, he originally wanted to use some form of automated followspot system to “grab any moving light and surreptitiously turn it into a followspot.” Given that frontman Kelly Hansen and bassist Jeff Pilson like to roam the stage a lot, and in the singer’s case, the audience during one song, this flexibility could’ve been key during Foreigner concerts. Back again this year is a simple laser system that Production Design International provides along with operator John Borcheding. The designer had some ideas that required a cone of lasers and other similar effects to shoot up from the floor upstage center. PDI owner Howard Ungerleider has a long relationship with See Factor and their Foreigner account manager Mark Friedman, so adding lasers to this show was easily accomplished. “There is the moving, articulating arm stuff, and then there’s the static stuff that’s above it,” explains Lastovka, who runs a grandMA2 light console. There are 12 Martin MAC Viper washes and 16 MAC Viper profiles “that are doing soft and hard edge stuff and some gobo patterning on the stage and in the crowd. That stuff’s holding all of our moving trusses, which are loaded with 72 Elation Rayzor 360Zs.” The Razors have a par type beam, but a moving yoke, so focus positions can vary between songs. Behind the massive band banner that runs across the stage is the familiar “4” logo from their biggest album, which emerges near the end with 22 of the Elation light fixtures mounted inside its circular truss shape. The drop is cascaded with sparks and lit up with pyro. Aerial Arts supplied the special effects. 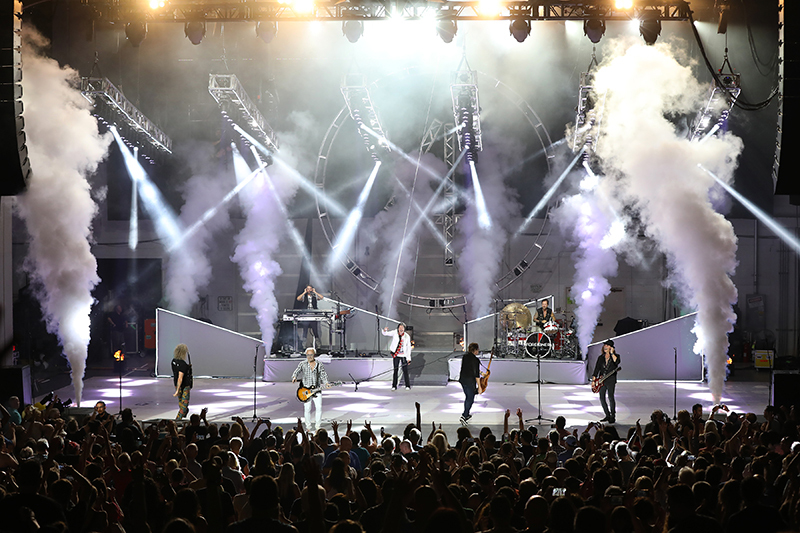 An important collaborator in the creation of the last two Foreigner tours has been Queens, NY-based lighting, audio and production rental house See Factor. Croxford likes that even though See Factor Is a large and legendary company, they provide him with personal service. “You don’t get lost in the mix. They pay attention to all the little details that make a production like this top notch,” he says. 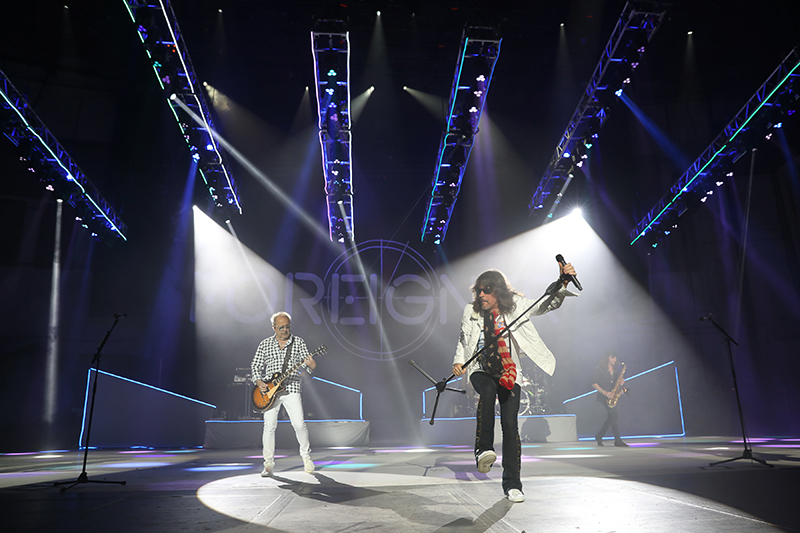 Whereas last year the trusses on the Foreigner tour went from the traditional left to right configuration, this year they run up and down stage. “They go from a relatively flat configuration to nearly vertical,” elaborates Lastovka. “As vertical as we could get it safely and fitting within the dimensions of the stage, and then the parameters of loads on the motors.” Variable speed chain hoists from Show Distribution were hung and operated by See Factor for the tour. See Factor had no problem tackling this unorthodox approach. “I rolled in to preproduction in Bangor, Maine, and the rig showed up as imagined,” recalls Lastovka, who certainly has plenty of experience under his belt. A St. Louis native, Lastovka began his career working at a local rock club called Pop’s around 1998, before moving to Music Creek Soundworks. 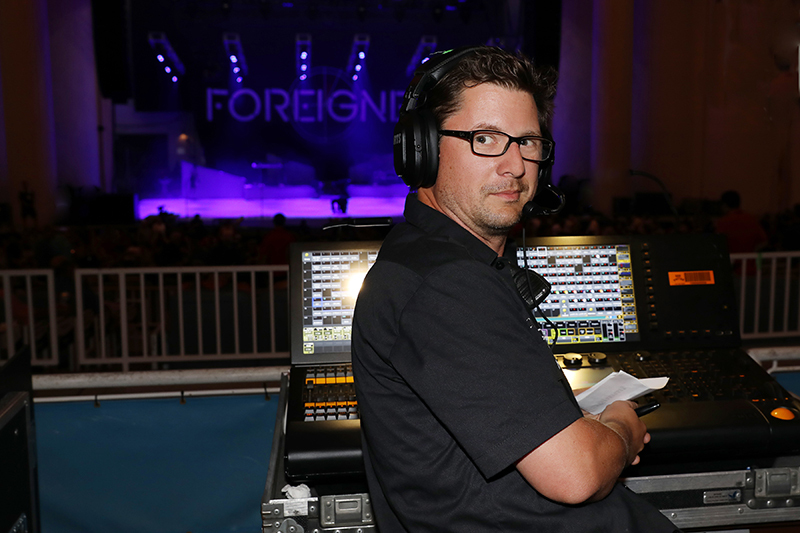 Then in 2003, his friend Brian Simon, whom he met at Pop’s and who is now Foreigner’s FOH engineer, got him his first touring gig with the Little River Band, loading lights and PAs for their shows at state county fairs, PACs and corporate events. After three years, they downsized their crew, and he became their monitor engineer for another three. Lastovka spent 2009-2010 touring as a guitar tech and monitor engineer with local band Cavo (who had the national hit “Champagne”), then decided he wanted to quit touring, return home and refresh his lighting knowledge. He did so with Logic Systems for two years, then in the fall of 2013 he got the call from Foreigner. It has certainly been a rewarding gig. Lastovka says he enjoys interfacing with bassist/musical director Jeff Pilson, himself an experienced road dog who understands the ins and outs of the business. They often share notes on various technical issues. Lastovka’s favorite look of the current Foreigner tour happens during the first chorus of “Waiting For a Girl Like You”. The trusses are really low, the light is a warm amber, and “I have the Sharpys fanned out, sparkling all over the place,” he says. “It’s this really big, uplifting look to that first chorus before it shrinks back down to the verses.” Throughout the show, Lastovka varies the lighting, so not everything has a big arena rock look. There is subtlety with some nice atmospheric lighting work. 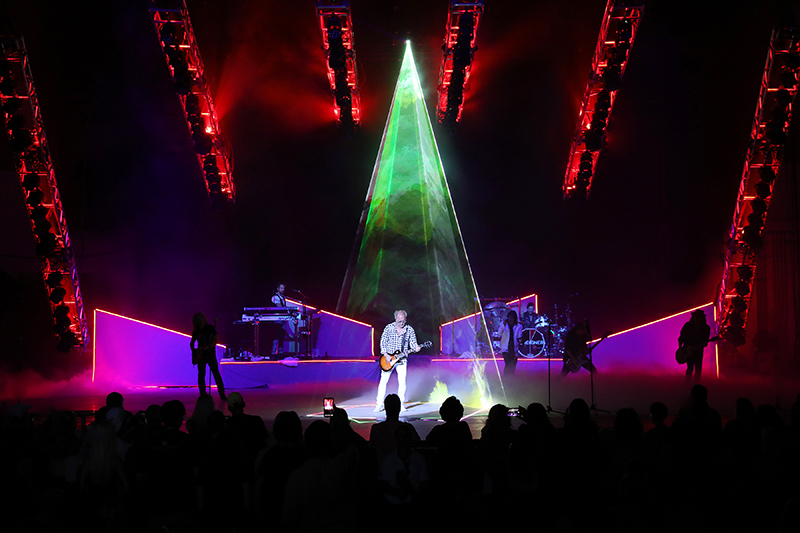 As the LD observes, “I’m making room for the song itself, or making room for other elements like the lasers in ‘Starrider.’” It certainly keeps the show engaging.